And the choice goes by forever, 'twixt that darkness and that light. "Happy New Year. We enter 2012 with a great deal of hope, but our hopes are not for more bailouts, or money printing, or any of the myriad policies that investors seem to hope will save bad investments and sustain elevated valuations. Instead, our hope is that in 2012, the market will finally "clear," in the sense that bad debt around the world will be recognized as bad and restructured; that overleveraged financials will be taken into receivership instead of forcing austerity on every corner of the global economy in order to make them flush again; that rates of return will rise enough to compensate and encourage saving – and high enough to encourage borrowers and other users of capital to allocate the funds productively. Of course, in order to restructure bad debt, someone has to accept a loss. In order for rates of return to rise, valuations must decline. In short, our hope is for events that will unchain the global economy from an irresponsible past and open the gates toward a prosperous future. Maybe that is too hopeful, but we are not entirely convinced that bailouts and 'big bazooka' will be as easily procured in the year ahead as a confused public has allowed in recent years." 2012 will the year that the consequences of the choices made by nations of the so-called developed world will begin to truly manifest themselves in the economic realm. We are in the closing chapters of the current Debt Supercycle, with different countries strewn out along the path, some at more advanced stages than others but all headed for a destination that will force major decisions if politically painful actions are not taken. The longer that process takes, the fewer options that are available and the more painful the outcomes. Some countries (think Greece, et al.) have a choice between dire economic circumstances and disastrous. The option for merely difficult choices was passed long ago, and the rules are such that there is no going back to where you started without a different but equally painful outcome. This is the time of year I think about the future, and foolishly opt to make predictions. This year I have decided to be especially foolish and to think about the next five years, especially for the US. Why five? Because I think by then the consequences of our past and immediate future choices will have been realized, the "reset button" as it were will have been pushed, and the economies of the developed world will be ready to move on to a brighter future. The question is, from what level will that new upward journey begin? It will be very different for different countries, depending on the paths they choose. Let me presage my thoughts. Most countries are being faced with dual choices, which differ according to their own particulars, but all deal with what to do about the need to deleverage, both in the public and private sectors. The end of the Debt Supercycle is a tectonic plate shift of massive global economic proportions, unlike anything the world has seen for 70-80 years. It will cause all sorts of economic earthquakes, tsunamis, and volcanoes. While the choices each country makes are their own, the consequences of their choices will have a much larger effect upon the world, as global interconnectedness has landed us in a world where isolating the impact of a problematic country is no longer possible. The need for global cooperation is most paramount at a time when politicians will be more and more restrained by the exigencies of their local problems and voter angst. Jumping ahead and, by way of example, taking a peek at the Greek newspapers, one would not think that the current Greek crisis is at root a problem of their own making. The culprits are those nasty Germans. Political cartoons depict Germans as saying they have finally won WW2. Not exactly the climate in which Greek politicians are able to make calm decisions or explain the need to accept a great deal of pain. And the German editorials and columns are awash with the question of why Germans should work longer and harder to pay for Greek retirements and "lavish" benefits while Greeks don't pay their own taxes. But choices must be made to proactively deal with the problems, or have the market force a severe solution. It is not a choice between pain or no pain, but exactly which pain do we prefer and how much? And anesthetics are not available on the pain menu. This is pain that will be felt from head to toe of the various national economic bodies, worldwide. The US, Europe (including most of Eastern Europe), Japan (a bug which will soon find that windshield! ), and even (especially) China must all deal with the problems that come with deleveraging. To fully understand the nature of the choices and their consequences, we are going to start somewhat far afield with some thoughts about choices and path dependence, then look back at history to see if we can get some clues about what deleveraging looks like (warning: it is not pretty), then examine the choices faced by specific countries and make some guesses as to outcomes, where possible. I should note that in spite of the rather dark tone of this introduction, I remain an unabashed long-term optimist. History shows that these periods end and new periods of growth and prosperity emerge. While for the moment the situation is stressful, the trick for individuals is to make the best possible choices, given the circumstances, with a view to that moment in the future when risk will once again be something to be wooed and willingly accepted, rather than avoided as much as possible. For nations, it is preferable to make the choices that will bring about a new equilibrium, even if doing so requires some pain. The longer that difficult choices are avoided, the greater the pain will be when the choices are either taken or forced upon us. That being said, so many choices are made by people and nations who happily blunder forward into what proves to be a disaster, swept along by the tides of emotion and rationalization, thinking that by avoiding the consequences of the real problems, things will somehow turn out OK. I am reminded of the times when I told my children to clean their rooms before they went out to play, and was cheerfully told, "I did," as they poured out the door, only to have Dad find that they'd stuffed all the detritus that was on their floors into the closets, drawers, and under the bed. The appearance is that there is order and calm, while in the shadows and cubbyholes lurks the sad reality. To be able to make wise choices means understanding and dealing with the real problems and not just the symptoms. In the US, the old joke was that doctors routinely told their patients to "Take two aspirin and see me in the morning" (which simply shows that I am old enough to remember an era when everyone had their doctor's home phone). And that was often the best advice, as most things do eventually take care of themselves, one way or another. But if you are lying in a ditch bleeding on the side of the road, you need more than aspirin. The European interbank credit markets are screaming that the system is at risk of a cataclysmic failure. Think Bear Stearns and Lehman. On steroids. We are rapidly coming to the point where we can no longer stuff the dirty clothes and toys under the bed. There is no more room. We are going to be forced to actually deal with the mess. That means that we will have to put "playtime" off for a little bit, but Mr. Market is going to stand over us and force us to clean the room. Better to get on with it. Breathes there a parent who has not lectured his teenage children on the consequences of making good and bad choices? Who has not tried to help them learn to figure out their own path in life? We make choices every day. What do we eat? What color shirt today? Do we take a new job, or ask for a raise? Almost everything is a choice or the result of a previous choice. There are whole genres of academic literature on choices and what drives us human beings to choose and do the things we do. Behavioral psychology and in particular behavioral economics is a topic oft discussed in this letter. But today I want to briefly focus on what might be thought of as the opposite of behavioral studies, and that is path dependency. These are not the choices that we think we make or that we would like to make, but the limited choices we have because of past choices and circumstances. The classic studies of path dependence try to explain how the set of decisions one faces for any given circumstance is limited by the decisions one has made in the past, even though past circumstances may no longer be relevant. (I would encourage those interested to Google "path dependence" and spend an afternoon [or night] reading some of the research.) But now, let me dismay the academics among my readers and resort to anecdotes and analogies to set the stage for our analysis of the end of the Debt Supercycle and to open a view on what awaits us as we journey down that path. There are several different types of path dependency. The simplest analogy is that we go down a path, come to a fork in the road, choose one direction, and go down that path until we are presented with another fork. If we decide we don't like that path we can always go back to some previous fork and take another path. Our only loss is the time we took and the energy (or money) we spent on that path, while we did gain some knowledge of the path we left, even if we ultimately decided not to go on. How many of us went to school to study one topic and perhaps even got a degree that we now don't use? Or started all over again in a different course of study? How often do voters elect a different group of politicians, hoping for change or a new direction, only for a majority to become disenchanted with the changes and opt for yet another change, or go back to the old political party? We fall in love with a stock or investment and then lose that love over time, and either stick it out or find a newer, more interesting investment. We can't change the past, but we often tell ourselves that we can change things back if we want to – we can always turn around and try again, we assure ourselves. Often there are things that are somewhat in our control. We can change. We can decide to eat healthy and exercise, or to change careers if we are unhappy. Sometimes those changes are positive and sometimes we act, even though the new path is not an easy one or one that makes everyone else happy. The problem is that there is another type of path, one that we cannot retrace. After we choose that sort of path, the way back is blocked, and we must go on dealing with the consequences of our chosen path. We may come to forks in the road and vary our directions on the path, but we can't turn back, no matter how much we would like to. We can choose other paths into the future, but the past will always be there. If we make a bad investment, we will lose money. I can't ask the market to give me back my money if the stock I picked goes down. If I own a business that is dependent on one customer and I lose that customer, I am out of business. If a bank lends money to someone who can't pay the money back, it is going to take a loss (unless it is a subprime mortgage and they can find some pension fund in Europe to buy it because Moody's say a whole bunch of bad loans are now suddenly AAA). If you are eight months pregnant, you can't go back to being just four months pregnant. It is better to make the wise, if harder, choice as soon as you can. And then there is yet another category of paths, the ones that are chosen for us, whether by family, circumstances, or fate; and once on them we don't know what we may have missed on alternative ones. Parents move to a different town and take the kids with them. A "chance" meeting becomes a new business endeavor. A torn muscle forces a promising athlete into another career. War erupts and changes the plans of young men. Accidents happen. Let's look at an example of a seemingly small choice that had large consequences much later. In 1953 some CIA types, with the blessing of senior US and British administrators, decided it would be a good idea to replace the elected prime minister of Iran with the Shah, who would more or less do what we asked and keep Iran from turning communist, which was a big deal in Western government circles at the time. And who really cared? We were focused on the Korean War and Russia and China, nuclear threats, and all sorts of other "distractions." It was a different time and culture. We trusted our government to do what was right to keep us safe. There was barely a mention of Iran in the papers. And eventually (1979) we got the Iranian revolution and the rise of the Islamist parties, with Iranian support, throughout the Mideast. Fearing that an Islamist revolution might develop in some of its republics, Russia panicked and invaded Afghanistan. An otherwise low-profile Democratic Congressman from Texas named Charlie "Good Time" Wilson (he did like to party) decided to make the Afghanistan rebels his personal cause, and "traded" all sorts of favors to get what became massive secret funding for the Afghanis, who not only succeeded but turned into the Taliban and helped train and arm a young Saudi named Osama bin Laden. And then along came 9/11 and the wars in Afghanistan and Iraq. Could any of that have been foreseen in 1953? Is there a path-dependent link? You be the judge. What would have happened if we had not meddled? Perhaps things would have been better, or they might have been worse. We will never know. All we know is what did happen (or at least what we have been told). We all have a lot of stories about the paths that we chose or the limits of our choices. The good choices we take credit for and the bad choices we blame on circumstances or find some way to rationalize them. The "invisible hand" of the market is millions of people making their own individual choices. Do we choose to rent or buy a house because one choice is better for the national economy? Why do some companies or unions support trade barriers and tariffs? Because they know that given a free choice individuals will buy the products of companies from "foreign" sources, and they persuade politicians to limit the choices of consumers to protect their own incomes, either by forcing them to pay more for foreign products or to buy inferior, locally made products. "We need to protect our jobs, don't we?" Even if it means we all pay more for products. And our choices add up. They become cumulative and create an economic tide. Policies and practices that initially seem small in the grand scheme of things can become much more significant when taken together and given a little time. "Essentially, the Debt Supercycle is the decades-long growth of debt from small and manageable levels, to a point where bond markets rebel and the debt has to be restructured or reduced. A program of austerity must be undertaken in order to bring the debt back to acceptable levels. While the focus of BCA has primarily been on the Debt Supercycle in the US, many of the countries in the developed world are at various stages in their own Debt Supercycle." A Debt Supercycle is not some new thing. Rogoff and Reinhart write about 266 such events in the past few centuries in their epic work This Time Is Different. It seems to be part of the human condition. We increase the amount of debt in a system until there is too much debt. Each and every time, the people and leaders in a country convince themselves that "this time is different" and the debt is not a problem to worry about. And that is true until some moment in time when the markets lose confidence in the ability of governments or businesses to service the debt. Professor John Cochrane of the University of Chicago has written a series of brilliant papers and articles on this problem, forcefully demonstrating the math that interest rates are partially a reflection of the risk that investors perceive concerning the potential for returns on their money. When they begin to lose confidence that a government (or business) will be able to raise enough revenue to pay off the debt at some point in the future, interest rates begin to rise. At first, there are all sorts of reasons given. Then there is a moment when the bond market simply walks away. Rogoff and Reinhart call it the "Bang Moment." Once that confidence has been lost, it is not easily regained. "A program of austerity must be undertaken in order to bring the debt back to acceptable levels." Governments or businesses have to demonstrate that they can get their budgets under control in order to get renewed access to the bond market. And make no mistake, austerity is a path for slow growth and/or recessions. We are used to countries like Argentina having their problems. But in the 1990s we saw what happened to both Canada and Sweden as they had to deal with that lack of confidence. While they had different answers, they came through their respective crises, although there were clearly economic costs, higher unemployment, losses, and very difficult decisions made. It is not just "banana republics" that have debt problems. Only a few years ago, European regulators were allowing European banks to leverage as much as 40 to 1, gorging themselves on sovereign debt, because everyone "knew" that sovereign nations in a modern world would not – indeed could not! – default; so why worry about leverage on government debt? Until Greece and then Ireland and then Portugal and now Italy, etc. I was writing early last year that Greek bonds would lose 90% of their value. This week we read that Greece indeed wants private investors to agree to a 90% write-off. Soon it will be public bond holders like the ECB that will take haircuts. No country starts borrowing money with the thought that they will keep on borrowing until there is an economic collapse. It all starts with good intentions. No bank lends money not expecting to have it returned. Then things change over time. Since there seemed to be no problem with the current level of debt (and spending), why can't we increase it a little more? There are countries that can keep their budgets and debt under control (like Switzerland and others). But politicians like to promise benefits today and pay for them with debt that future generations must incur (like the US and countries all over Europe). Or they try to spend their way to prosperity and growth (like Japan). And of course they promise that "in the very near future" they will get the deficits under control. "We will grow our way out of the problem. We will limit the growth of spending next year, when the economy is better. We can always raise taxes on the rich. Or increase consumption taxes. Or create some taxes somewhere." Whatever it takes to convince the bond market to keep on funding their spending. And so the choices to provide this benefit and that program, each justified by some reason and desired by some group of voters, add up over time. Everything goes well until there is a recession. Then revenues go down and costs go up, because unemployment benefits rise. But because the natural business cycle leads to recovery and growth, things soon get better and the game continues. But then the accumulated debt becomes too much to handle when the next recession comes along. And bond investors lose confidence and the Bang Moment has arrived. Cochrane shows that there is no magic number or formula, no way to know in advance when that moment will be. Unless a country chooses to deal with the pain of cutting spending and raising revenues, eventually there is a true crisis, resulting in massive dislocations and losses. Bond holders lose a large percentage (if not all) of their investments. That moment is often precipitated by a credit or banking crisis. And when the banking system freezes up, businesses lose access to capital, and the recession can turn into a depression if not dealt with aggressively. But that means pain. Let's jump ahead to an illustration we will refer to again later. 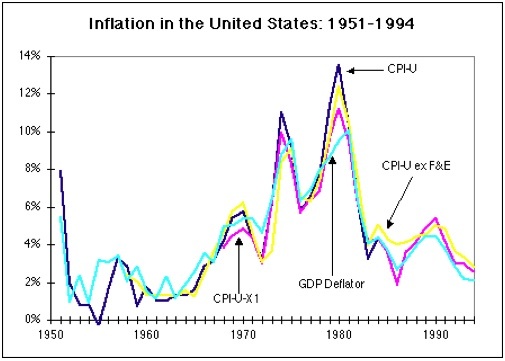 In the late '70s, inflation in the US rose to over 14%. I remember borrowing money at 18%. The stock market lost about 40% in just 18 months. Unemployment was high and rising. It was the single largest failure of US monetary policy since 1950. While some blamed it on high oil prices, or speculators, or greedy businesses or unions, the fact was that the Fed printed money to allow the government to run large deficits. And US politicians supported the policy because it allowed them to spend money. And then came Paul Volcker. He is now credited with almost singlehandedly forcing the inflation genie back in the bottle. He is everyone's hero. But back then there were plenty of people who did not like what he was doing, because he precipitated two major, back-to-back recessions, in 1980 and 1982 (as bad or worse than what we just went through). Unemployment climbed above 10%. The stock market got hammered even further. We look back now and say "It had to be done." That is great with hindsight, when we are long past the recessions. But it was tough in the middle of the recessions to explain just why we needed a tighter monetary policy in the face of 10% unemployment. What if there had been no Volcker? No one to stand at the door of the Fed and say "No more!" What if the Fed had continued to print? Then inflation would have risen even more. 25%? Bank loans of 35%? Higher? Who knows? At some point, the math, even for the US, does not work. There is a limit to what a government can borrow and a central bank can print without a total collapse of the economy. There would have been another depression at some point. There would have been no Reagan Revolution, because to cut taxes when inflation was 25% and deficits were higher would have been unthinkable. We would have stumbled from crisis to crisis, cutting spending and programs only to have revenues fall and costs rise. It becomes a debt spiral that always ends badly. Would Reagan have tried, anyway? I think so, as that was part and parcel of his philosophy. But he would have been blamed for the recessions, and not Volcker. And in the midst of a crisis, how do you get Congress (or any politician) to make the right decisions? Volcker chose a hard path. But it was a better path than the one we'd been going down. He hit the reset button. But did it seem like a better path at the time to anyone who could not find a job? To those on a fixed income? To the business owners who lost everything? To investors who gave up faith in the stock market? Most nations in the "developed world" are coming to, or are already at, the end of their Debt Supercycle. They will soon lose their ability to borrow money at low rates, absent a demonstrated ability to control their budgets. An abilitythat almost none has shown. And when you look at the cost of the promises made to an aging population for healthcare and retirement benefits, the future costs are staggering. There is no way such promises can be kept. And one by one, with increasing frequency, countries will find their interest rates, the cost of servicing their debt, of getting people to buy their bonds, will rise to the point where, absent a central bank willing to print money in massive quantities, their budget and economy will collapse. Banks that have "invested" in huge amounts of sovereign debt will see their capital wiped out, seemingly overnight. In Europe in the past few weeks, almost €500 billion has been deposited at the ECB for a return of 0.25%. The interbank market, when it functions, will pay 0.40%. Why would a bank take less money from the ECB? Because they can't get other banks to lend them the money. Banks no longer trust the ability of other banks to pay them back. UniCredit in Italy is raising money at a 40% discount to their already depressed stock price. They will not be the last to be forced into such choices. The credit markets are telling us there is a crisis in the making, on the scale of Bear Stearns or Lehman in 2008, except that now governments have less ability to step in and salvage the banks. Now, government debt is the problem. Just as you can't solve the problem of being drunk with more whiskey, you can't solve a debt problem with more debt. But that means hard choices. And the choice right now, is how long should this letter be? I think we are at a good breaking point, so next week we will look at why the choice in Europe is between recession now or depression later. We will take a look at periods of deleveraging in the US in the 19th century, and see what happened. While there were indeed massive dislocations of the economy and huge investor losses, a few good lessons were learned and applied, until recently. We will look at what choices countries can make. Some, like the US, still have a viable path to control their bond markets and avoid a depression or major recession; but there will be pain. Think Volcker. Others simply will get to choose between what type of depression they want: short and deep or long and exhausting. Will the Greeks become debt slaves, working for an entire generation at reduced wages to pay their debt and remain in the eurozone, or will they leave and suffer very large currency losses and the loss of access to the credit markets? Not a very good set of choices, but that's all they have, unless they can convince German taxpayers to fund their deficits and rising costs ad infinitum. Good luck on that one. We will find that the European crisis will create serious problems for the rest of the world. Global growth is set to slow rapidly. By the end of this year, we may be happy that there was any growth. And next week we must address Japan, China, and the US. So much for the quick, easy forecast. But those you can get anywhere. Google "economic forecast 2012." There are 2.8 million hits. I'm sure you can find several that fit whatever mood you're in. We will take the longer path, but when we finish we will have some idea of where we're going. Stay with me. First, let me wish you a very personal Happy New Year! It looks to be a busy one for me. Next Tuesday I am off to Hong Kong to speak at a conference for the Hong Kong Economic Journal. I am told there will be a simultaneous translations into Chinese. Then Singapore the following Sunday, and back on the 20th. I will again be writing on the road, but I expect you will get your letter next weekend at the usual time. I am very pleased to announce a special new publication called Mauldin Research Trades. It will be launching on the Bloomberg terminal platform in two weeks. This is a really exciting publication that will be a collaborative effort of half a dozen of the best technical analysts in the world (they literally have written a couple of dozen books on technical trading), who will contribute trading ideas to a select, very limited group of Bloomberg client subscribers (mainly institutional and trading funds), based on my macroeconomic views. In addition to the exclusive new publication, my Thoughts from the Front Line and Outside the Box letters will also soon be available to Bloomberg terminal users all over the world. I am launching the publication with my good friend Barry Habib (whom you know from his writing on mortgages and frequent appearance on CNBC). He is an essential part of the project (and the source of some of the best trades so far!). And Peter Mauthe is heading up our effort in my office. This new publication has been developed specifically and exclusively for distribution to Bloomberg terminal users. You can contact your Bloomberg representative for details. I will provide more information in a few weeks, after the official launch. On a personal note, long-time readers know that I have written about the joys of wine and other adult beverages. They have been a source of pleasure. But for health reasons, my doctor, Mike Roizen, made it very clear I had to quit drinking, which I did about five months ago. Yes, cold turkey; and yes, it was not easy, especially on airplanes on international flights. But you do what you have to do. As some of you know, I intend to live a very long time. Hopefully long enough for Mike West of Biotime to figure out how to reverse the aging process, so I can live a very long time indeed! And since I want to give Mike (and others who are also working on the problems of aging) as much time as I can, I have had to make some very hard personal choices. Even chardonnays are off the menu. So until someone can come up with a genetic treatment that will allow me to metabolize alcohol with no side effects (talk about a killer business model – I will invest! ), I am "on the wagon." It is quite late and time to hit the send button. Enjoy your week. In the coming year, let's focus on what we need to do to get through this rough patch we see coming. We can do it, you and I.
Jan. 16, 2012, 2:09 p.m. The “invisible hand” of the market is millions of people making their own individual choices. Do we choose to rent or buy a house because one choice is better for the national economy? Why do some companies or unions support trade barriers and tariffs? Because they know that given a free choice individuals will buy the products of companies from “foreign” sources, and they persuade politicians to limit the choices of consumers to protect their own incomes, either by forcing them to pay more for foreign products or to buy inferior, locally made products. “We need to protect our jobs, don’t we?” Even if it means we all pay more for products. John is a “free trader” and globalist who extols the virtue of having cheap goods to buy vs. buying one’s own “inferior and overpriced goods” But many of the goods we buy from China are not just second rate, but dangerous, such as food, toys, and pharmaceuticals. They also steal industrial and military secrets from us any time we give them access to our technology. Free trade must be fair trade and we must also protect our intellectually created assets such as military and industrial technology. If our people do not have jobs to provide sources of income, they will not be able to buy even the cheap imported goods that Wal-Mart sells. As John has so ably pointed out, the government has reached the end of its ability to compensate for the destruction of private sector income. John tries to visualize where the next wave of growth will come from 5-10 years from now. But it, too will only be of temporary benefit if we allow our innovation to exploited by the globalists and and stolen by thieves. Most of the excesses of labor unions, such as in GM, have been pared away but the lavish rewards to management and financial manipulators who take a share of the national wealth far out of proportion to any wealth they create for the economy continues, seemingly unabated. John has complained about many unsound Wall Street practices, but he does not see how globalism and unfair “free trade"are like cancer, which is the growth of of genetically corrupted cells which the body’s immune system is unable to destroy, eventually threatening the life of the entire organism. Jan. 11, 2012, 6:32 p.m.
A balanced and perceptive analysis as ever, though I think you might want to revisit your financial text books for a reminder of the maths behind an equity rights issue, given your implication that Unicredit was forced to issue equity at a 40% discount. Rights to subscribe to new shares are awarded only to existing shareholders, giving them the “right” to contribute new capital to the business and not see their shareholding diluted. If this rights price is less than share price, then the rights thus have a tradable value (the difference between the two prices), which can be sold to non-holders (or in the case of the Italian equity market, auctioned off). The price at which these new shares are pitched is thus (almost) irrelevant, since the percentage of the business owned by shareholders remains the same, even if the headline share price is significantly adjusted once the shares go ex-rights. The change in share price is offset by a change in share count. Thus the fact Unicredito has launched a rights issue at a 40% discount means little, if anything, for the equity value of the business. It certainly isn’t reason behind the subsequent fall in the share price, which is much more to do with surprise at the sheer scale of the fundraising, and deepening gloom on the ability of the eurozone and its banks to dig themselves out of the hole they are in. Jan. 9, 2012, 9:52 p.m. While I like to think your predictions of a reset within 5 years are accurate, I do not think you are giving adequate consideration to the effects of oil scarcity. It is a fact that we have extracted the easiest 50% of oil already, and that no new energy source has even a small change of replacing it anytime soon. We can study the periods from the 19th century, or even the Great depression, for clues as to how economies can reset from massive deleveraging events. But there has never been a period of meteoric growth worldwide like we have seen in the cheap oil era of the last 100 years or so. Because of this, the heights from which we must fall are that much higher than they ever have been before, and the perception of pain felt by societies as they fall will be so much more. Resource wars, massive unrest, and geopolitical conflict in ways we have not contemplated before are virtually guaranteed. Unfortunately, though we are maybe 3-4 years into this right now, we are just in the first inning of a full nine-inning game, I fear, and, as yet, I cannot point to a single constructive step taken by any government or central bank that moves us in the right direction - can you? I fear the drame has only just begun. Jan. 9, 2012, 6:08 p.m.
there is simply not enough new cash being generated by the fiat system to feed all the previously existing bonds, rents, etc. or they need to prepare for asset prices to fall to pre 1980 levels - and just deal with the consequences. Jan. 8, 2012, 11:49 p.m. Excellent and down to earth, John! For the U.S., there is no mystery in what needs to be done first: rein in the financial sector so that it doesn’t kill the economy and then the currency! Then decide that our nation is more important than the profits of global companies. All pointing to the oligarchy taking some losses! Jan. 8, 2012, 4:02 p.m.
Congratulation, Mr. Mauldin, to a fine analysis-overall conclusions to which not only a studied economist can agree with, but “normal” folks. too. Unless that is, you were a Nobel laureate, called Dr. Paul Krugman, who does not tire to resurrect Keynes anti-cyclical dogma to combat today`s structural predicaments. So, for example in a recent ( 92/01/12) article in NYT “Nobody understands debt”. “Certainly, it greatly matters who is holding national debt: locals or foreigners. Thus, Greece and some other countries with high external debts are considerably more exposed to market vicissitudes than countries with similar or even higher indebtedness, held primarily by local subjects. To boot, USA has the exceptional advantage that the dollar has become and still is universal currency. This fact alone broadens US capacity to borrow by a factor Y compared to all other countries. However, it also increases the country`s vulnerability in case of global disorders beyond control affecting markets` trust and confidence. Where Dr. Krugman`s analysis seems failing is in the implicit assumption that historical levels of indebtedness would provide benchmarks for acceptable levels of debt today and in future. This is not the case, The question where is the limit of public debt cannot be answered numerically. Instead, when trust in borrowers` repayment capacity starts to evaporate in international markets, interest and other signals galore, policy is overdue to pacify unruely markets with confidence building measures. Whether deficit-spending policies Ã la Keynes will do the trick, Krugman`s philosophy, too, thus adding additional debt to the stock of public debt- or whether confidence would be restored best by consolidation policies ie, increasing public savings by cutting public expenditures and increasing taxes, raising public efficiency, has become a matter of ideology. This economist no friend of ideological bastions adheres to the concept of “it all depends”. Are resources in the economy un-underemployed, is there a structure at hand that the additional funds would generate efficient results or do they have a negative muliplier, high opportunity costs, what are the economic and political; security risks of consolidation policies - just mentioning a few of cost-benefit deliberations required to minimise potential risks of policy failure. Analysis outcome and recommendations might entail a combination of measures concentrating on savings and efficiency improvements in the public sector combined with “measured” public growth policies. Certainly, Dr.Krugman would raise to the task by being less orthodox and a little more pragmatic”. P.S. Just an afterthought-. Your abbreviated version of events above . ..“turned into the Taliban and helped train and arm a young Saudi named Osama bin Laden. And then along came 9/11 and the wars in Afghanistan and Iraq” may need differentiation. Events linking 9/11 to the Irak required “ingenuity” by the Bush administration and the power to set it in motion against a swathe of the world`s opinion. Many forks in different stages were at hand to avoid the resulting fiasco. Jan. 8, 2012, 6:36 a.m. Regarding your brief history lesson regarding Iran; the reason the CIA overthrew Moussadeq was because Moussadeq wanted more income from Anglo-Iranian Oil Company .... not because they were afraid Iran was going communist…....“threat of communism” was a dishonest rationale used by USA all over the world to do bad things. Jan. 8, 2012, 3:48 a.m.
John, your current article is interesting and enlightening as usual, and I look forward to next week’s column. However, in my view, a major problem is reflected in your statement: “but Mr. Market is going to stand over us and force us to clean the room”. Source: JohnMauldin.com (http://s.tt/158aq) This seems to imply that Mr. Market is a wise and prudent parent when, in fact, it is comprised of the major financial institutions around the world who may be concerned about a clean room in their casino, but couldn’t care less about the children. Of course, governments, who are supposed to possess some wisdom, should provide the checks and balances on the casino so the children can receive some positive nurturing and guidance. But, they are like the grandparents who are well-intentioned, but are also happy to relinquish any final responsibility. Moreover, the parents are usually happy to tap the wealth of the grandparents through any hand-outs they can get, including any insider-trading information to gain an an edge against their competitors. Capital is king in a “free” market and we know who has the most capital. Therefore while the financial institutions rule, and there are limited restraints on their trading freedom and profits, I see the situation in the West being: “business as usual”. Governments could create employment and stimulate economic growth by subsidising new employees for the development of existing small businesses. Of course, this would require business plans and performance measures, and has been done in New Zealand before. It should be done again instead of bailing out scores of bankrupt and fraudulent “finance” companies which operated with no productive performance measures or, in some cases, no prior successful business experience. economy for the benefit of children as it is only interested in it’s own gain. For example, is it true that the circulation of money in the USA is at it’s lowest level for years, in spite of QE1 & QE2? While financial institutions hoard money and trade against one another, they are happy to see productive businesses struggle to survive and lay off employees. In any major economic adjustments where businesses have to respond to new market conditions, do banks actually change their operations that much in response to the new normal? Certainly, in the latest recession, they’ve just relied on another handout from the grandparents. Jan. 8, 2012, 3:02 a.m. Whether “Greeks” are better off staying with the Euro (at the cost of higher taxes and reduced public services) or leaving the Euro (at the cost of a bank collapse and import inflation) depends on which Greeks we’re talking about. A Greek banker, insurance broker, government official or corporate executive will certainly prefer the former, as it maintains his/her income and/or asset values in a globalized economy. A Greek hotel employee, manufacturer or real estate broker will likely prefer the latter, as it would boost tourism, make exports more competitive and increase sales volumes from foreign buyers. If I were Greek, I would vote to leave the Euro. this is because the only just solution to any economic crisis should visit the “pain” most heavily on those who either benefited from the phoney credit expansion and those whose policies caused it. In Greece’s case, that is the former group, not the latter. Jan. 7, 2012, 7:22 p.m. In an interview with you, Simon Black opined that you have one of the most perceptive mind regarding macro trends. It certainly seems that his opinion is correct. My compliments! My own view is more subjective. Where one lives on a time line seems much more important than are the macro trends. Sure, we talk of the depression of the 1930s; that’s interesting but from my viewpoint, when my family’s fortunes reversed during that time, my entire life was thrown into disarray. Subsequently, I faced military service during WWII; again, although some minor choices were available, there were no real choices. My point is that each of us is more like a cork floating in a turbulent sea than is any one of us like individuals who have rational choices. At this point, I conclude that our grouping together creates problems. Most Europeans seem to be suffering from a mistaken view of grouping, subjecting many individuals to hard times. Like I say, it depends upon when one lives on a time line. In any event, it seems that smaller political entities can be much more “humane” in that problems will be recognized well before they become so overwhelming. Thus, decentralizations can benefit most of us. Maybe that will be in our “collective” futures.